Traditional architecture, built on the mountainside, Le Chalet overlooking the St. Lawrence River, gives you plenty of time to admire this unique landscape of the Charlevoix region. Rediscover the comforts of home with our four spacious bedrooms, three with queen beds. The fourth bedroom is spacious, bright and cozy with 2 double beds. The fourth bedroom is spacious, well-lit and equipped with two comfy double beds. Open space on the 1st floor with unique panoramic view of the St. Lawrence River and the Isle-aux-Coudres area. Ground fully landscaped garden including a relaxation lounge with a TV, a fireplace and a pool table. 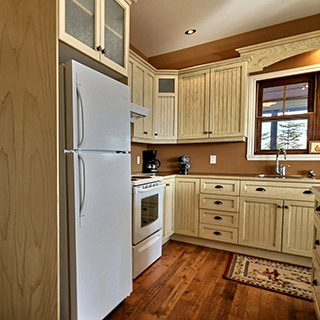 Large functional kitchen where you can cook dishes surrounded by your family or friends. Large functional kitchen where you can cook dishes surrounded by your family or friends. Blending classic style with contemporary design, this stunning luxury chalet with a size of 2750 sq. ft. can accommodate up to 12 people. Built on a large 35,000 sq. ft. wooded area; Chalet Beaulieu overlooks the banks of the St. Lawrence. The huge windows covering almost all of the eastern part of the cottage offer a breathtaking view of the landscape of Charlevoix and l’Isle-aux-Coudres. The chalet has 5 bedrooms and 3 bathrooms and can easily accommodate two families with children. 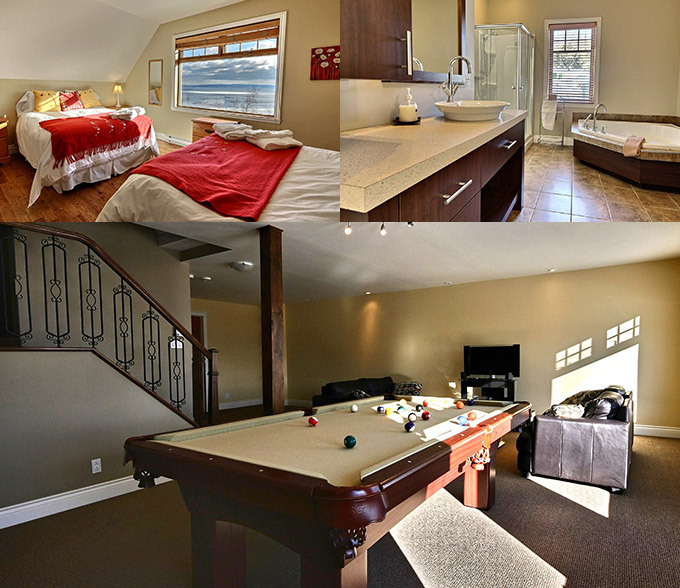 Pool table, spa, two televisions including cable, wifi internet, are all able to distract you while enjoying the unique landscape in the most prestigious development in the region of Charlevoix .